In this episode John and Jolene interview Siobhan Huggins. "Right hand of Dave, knitter of shawls, mother of lipids, cholesterolcode.com is my home base"
Are you new to Keto? Have you started, but are struggling? Are you a veteran Ketonian? Well you are in the right place! 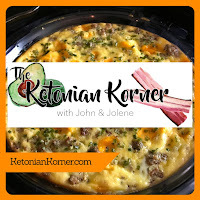 The Ketonian Korner is hosted by two coworkers, John Davidson and Jolene Hale, who have a round table discussion and keep it real go subscribe. In this episode you will hear John and Jolene talk about their experience with carnivore and give updates on the launch of Jo~Jo's Kitchen. Jo~Jo's Kitchen will produce dry mixes for cakes and breads. In this episode you will hear John and Jolene interview John's long time friend Melissa. Nutrition isn't something that people naturally talk about, so until very recently, John didn't know his friend Melissa had ever tried keto or that she is currently carnivore. Melissa describes what she eats and some of the reasons she moved toward carnivore.